In the second funding phase we shall focus on power/energy efficiency with respect to the dark silicon problem. Within the paradigm of invasive computing, the objective is to ensure that invaded claims remain thermally reliable while providing the teams for invading and executing i-lets for infecting. Energy efficiency is a prerequisite for high performance in various application domains including embedded computing. Power efficiency is crucial to meet the physical constraints imposed by thermal issues. By various industrial and academic sources it is predicted that a significant percentage of the totally available cores on a chip in future manycore systems may not be simultaneously powered-ON due to the thermal design power (TDP) constraint, also known as “dark silicon”. As a consequence, TDP may prohibit invasions even though un-used computation or communication resources are available. This mandates the need for effective and proactive dark-silicon-aware power/energy management and budgeting facilitated by various knobs like dynamic voltage frequency scaling (DVFS), dynamic power management (DPM) (to decide when to active/deactivate a core) etc. To enable management and budgeting, a fast on-the-fly data analysis and diagnosis is required to feed the power/energy management with indicative information distilled out of chip-internal data and instruction traces, which may grow to Tbit/s streams in manycore architectures. Appropriate filtering, compression and analysis is required to provide accurate status information and predictions on performance/workload, power consumption, and power densities to the power/energy management. 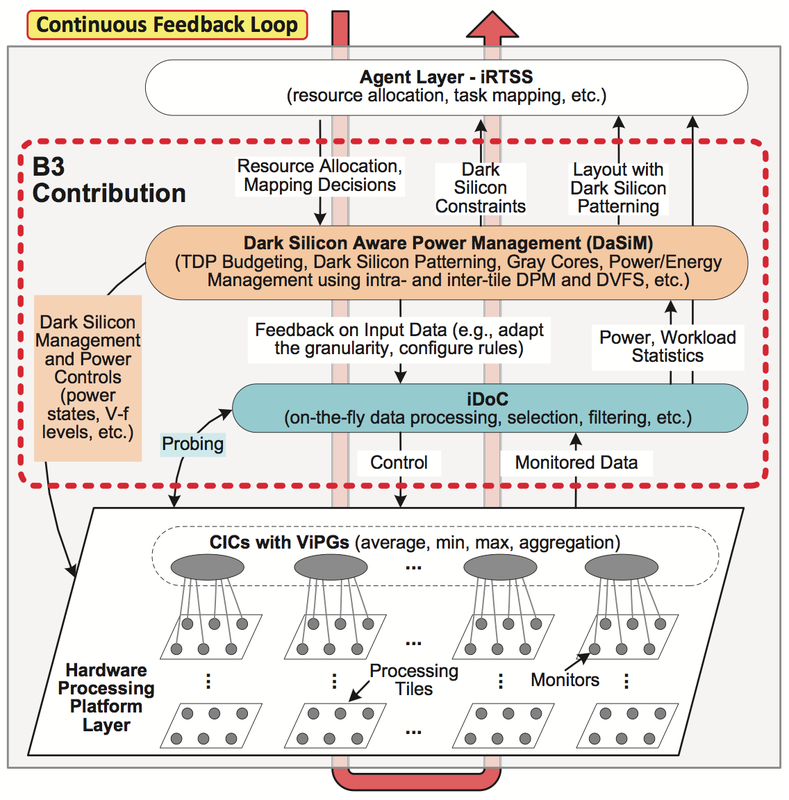 Objective 1: Improving power efficiency under dark silicon constraints. Objective 2: Developing an adaptive system for dark silicon and energy management. Objective 3: Modelling and online estimation of dark silicon for invasive computing systems. The related scientific challenges include the maximisation of the performance under a given TDP budget, maximising the performance under a given energy budget, minimising the energy consumption or peak power under a certain performance requirement, and designing fast on-the-fly data analysis and hardware diagnosis methods. A comprehensive summary of the major achievements of the first funding phase can be found by accessing Project B3 first phase website.